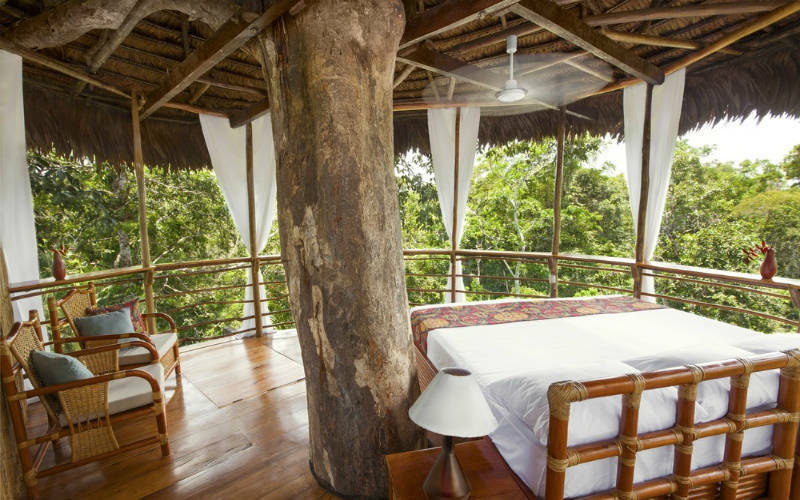 TOPICS:slept in a tree house!tree houseWhat cabin to choose? When we got married some friends gave us activities. We already talked to you in a video: we climbed in a balloon over the Bages and everything was a surprise until we got to where the balloon was coming from. In this post we will explain another gift that they made us: go to sleep in a cabin in a tree in Cabanes als Arbres. Cabanes als Arbres is a place with several cabins in trees where you can spend the night in nature. The place is just over an hour and a half from Barcelona, ​​near Sant Hilari Sacalm. When you arrive and do the check-in, they explain the security rules of the cabin and give you a basket with several things you will need in the cabin: a lighter to light the fire inside, portable lamps, batteries for the lamps, a map of how to get to the cabin … All very adventurous. If you decide to spend a night in Cabanes als Arbres you have to know that there are 10 cabins. To choose one you have to think how much you want to walk through the forest, how you prefer access, which views you prefer. The cabins are at different distances from the farmhouse where the check-in is done and the car is parked. According to what you can or want to walk through the forest you can discard cabins. Some of the ones that are further away from the farmhouse, the Mallerenga and the Cargolet, have another area to park near the cabin. So you can try to go on foot and if you do not see clearly, take the car. Another point to consider is access to the cabin. It can be with a vertical ladder or with suspension bridge and ladder but shorter. Think that the access hatch weighs and if you have a vertical ladder you have to open it. Apart from taking into account this, if you like ornithology, the name of the cabin can also influence you in making the decision. The names of the cabins refer to different species of birds. We can stay in the Oreneta, Bosqueta, Pit Roig. Our choice was the Mallerenga cabin. It is about 600 meters from the farmhouse where you check-in . You can walk through the woods or drive to a parking lot right next door. To access you have to go through a suspension bridge to below the cabin. There are about 7 or 8 steps to the trapdoor that is locked to enter the cabin. Dinner is not included in the price but it is the most comfortable option. There is very little there, so as you do not take anything to eat in the cabin you will have to go far to dinner. The dinner was good but we saw it for what it was. If you come to the cabin at night you have some fronts to see through the forest. We used them when we returned from dinner at the farmhouse, since it was already completely dark. What to take to a cabin in a tree? We went in the month of April and towards quite cool. We lit the fire while we were awake but we did not dare to sleep leaving it on. In the cabin there is neither electricity nor running water. The showers are in the farmhouse and the toilet in the cabin has a bag inside with sawdust. After a lot of looking at the dates we ended up going on a Thursday because there was no availability on Friday or Saturday until after a long time. You can book on their website , where you can also choose if you want dinner and what cabin you want to go to. In Cabanes als Arbres children under 10 years old cannot go. I imagine that because of safety issues, since climbing a child up the vertical ladder to the tree would not be very safe. To get there you will have to go by car, there is no public transport there. We rent one at Rentalcars for the occasion. Being an SUV was better, since the road to get there was not asphalted. Book a long time in advance if you want to go on Friday or Saturday. And if it is closer to summer, better than better because it will make better temperature at night and you can take a bath in the pool of the farmhouse. What to see in Girona: If you plan to visit Girona you can see what we saw on a day of visiting the city or see our top 10 of Girona . Go by public transport: You can go to Girona by train or bus. Then to go to the villages you can look on the website of moventis , which has a network of buses that go to the towns of the province of Girona. Where to sleep in Girona: We stayed at this hotel. Quality price was a very good option since it was not expensive and we were in the center of the city. Another day we were in the province of Girona we were in a rural house in Esponella . If you are not convinced, you can see other accommodation options in Girona here . Rent a car: If you prefer to visit by car and do not have, you have the option to rent one for the days you want to be on route. Flights to Girona: If you do not live in Catalonia you can go to Girona by plane directly without going through Barcelona. 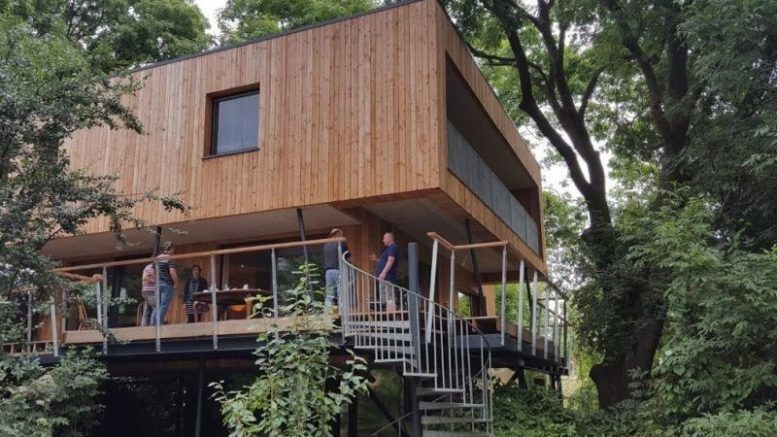 Be the first to comment on "When we slept in a tree house!"